Thornton Hibs played out their first goalless match of the season at a sunny Gorebridge against Arniston Rangers in the Premier League last Saturday. The pitch, unlike so many others that fell foul of frosty overnight conditions, was actually pretty soft all over but very much playable. Normally games without any goals are instantly forgettable but this one will be memorable for the wrong reason when, in the 34th minute, everyone there witnessed one of the strangest decisions that they are ever likely to see. As the Hibs played the ball upfield referee Newman blew for offside against Shaun Keatings. Except the Thornton midfielder was in his own half and the referee knew this because he even asked the Arniston player to bring the ball forward into the Hibs’ half for the free-kick. Good job Neil Lennon wasn’t standing in Craig Gilbert’s boots then. As far as goal-scoring opportunities go, they were few and far between. The only real save of note that Scott Costello had to make came on the stroke of half-time when he dived full-length to keep out Liam McIntosh’s powerful drive. 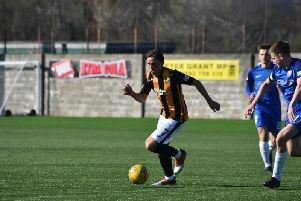 then, near the death, Daniel McNab sent in a corner kick that eventually found its way to Adam Drummond who watched in anguish as his header came back off the crossbar. Hibs: Costello, M.Robertson, McMillan, A.Drummond, Shanks, Coleman, Keatings, Hepburn,Ireland, Thomson, Anthony. Subs: Buchan, Adam, Crichton, McNab, Shields.